79th Assembly District's 2016 Salute to Women Leaders! Words Alive is proud to support both staff and volunteer team members who received recognition this past weekend at the 79th Assembly District's 2016 Salute-to-Women Leaders! The event is a tradition from 1987 in which women who improve the quality of life in our communities are acknowledged. 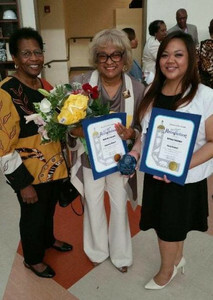 Words Alive's own Teen Services Program Manager Theresa Tolentino (left), was the recipient of the Social Service Award. Theresa adeptly manages volunteers and programs that connect 450 teens from Juvenile Court and Community Schools across the county to rich book discussions, writing programs, book ownership (often the first for many of the kids), author events, arts projects, scholarships, mentors and more. Most recently, she collaborated with teaching staff to develop a Share Your Story workshop, encouraging students to find their voice, develop a positive self-image, and hone the communication skills needed for successful writing, resumes, and interviews. Theresa is a champion of Words Alive's mission and embodies the power of service and education. We are proud to see her get recognized for all of her achievements. Theresa is joined (right) by Words Alive volunteers Billie Greene, who was recognized in the Community Activism category, and Ethel Daniels. There were a total of 32 nominations in all. Congratulations Theresa and Billie for a well-deserved salute to your community service and giving spirits! Thank you for your help in fulfilling our mission, to open opportunity for life success by inspiring a commitment to reading!